I am trying to do a follow up on my students from PS 166 class 3-305. I believe that I have found you. I am extremely proud of all your accomplishments. Please email me back with an update. I would love to meet with you to discuss old times. So we met for lunch in the city the following week and reminisced about old times. She looked the same except she had straight hair instead of the reddish curls I remember. It was so weird to be sitting next to her as an adult! Follow the yellow brick road! I still have one of those paper corn stalks from the set in my closet. I am such a hoarder. 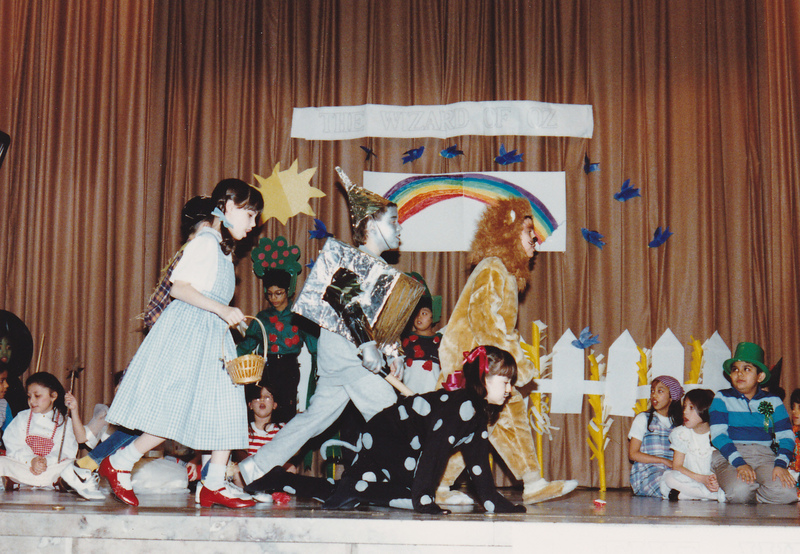 Me as Dorothy, with the Lion and Tin Man in the background. I love the tree costumes! We had really great costumes, most of them hand-made. 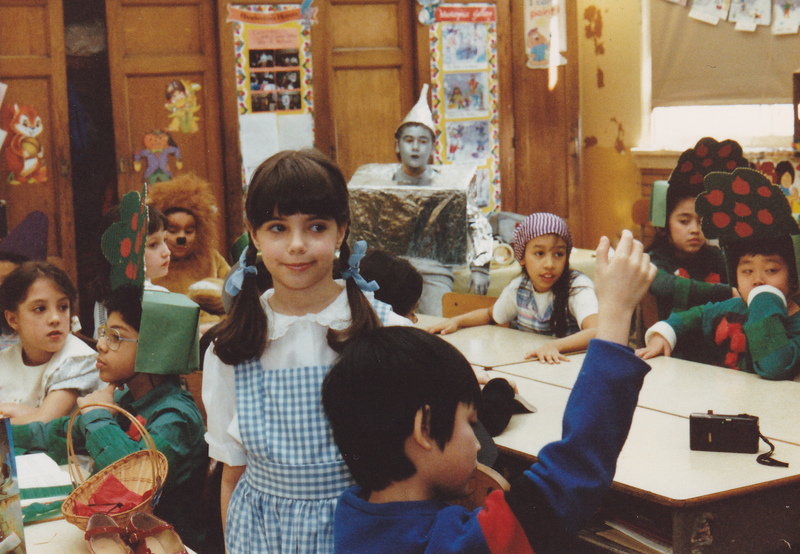 My mother sewed this Dorothy costume from a pattern she got at the Five and Dime – can you believe it? My former teacher said that it got harder and harder for her to put on plays like this as the pressure to teach for standardized tests mounted. What a shame. 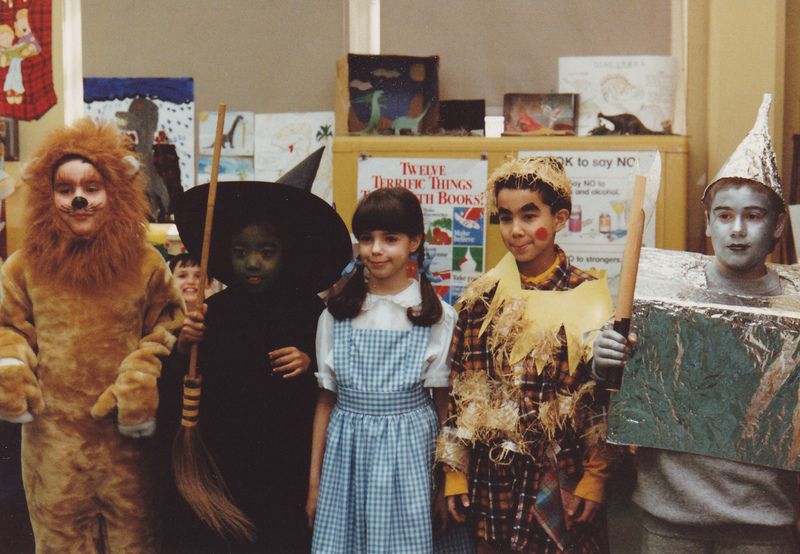 This was one of the defining moments of my childhood, and you can see how much love and care we put into this play. More kids should be given this opportunity.